A layered dessert that began as a European confection, which was made in England. Sheets of sherry infused sponge cake, cut to fit in a round bowl, were spread with jam and a pastry cream or egg custard. All of the ingredients were neatly layered, with additional foods added, such as fruit and chocolate. 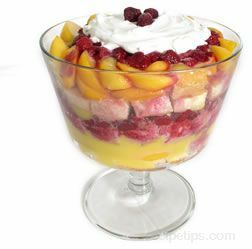 Typically, the trifle was made and delicately placed in a glass pedestal bowl, providing a distinctive way for diners to visually appreciate the layered appearance, the beautiful fruits, and rich ingredients of the trifle as they view it through the glass sides of the bowl. Today, trifles are made with a variety of ingredients that may be made for a dessert, a salad or a main dish. For desserts whipped cream often replaces fillings of custard. For salads it becomes a way to layer many different ingredients such as a variety of lettuce, vegetables, cheese, and meats topped with a savory dressing. Meats, beans, cheese, and vegetables are also being layered to create main dishes that combine many different flavors. When the ingredients are layered, they are not packed down into the bowl, allowing spaces for the various items to merge together. After the salad or dessert trifles are assembled, they are refrigerated for several hours or overnight to allow the flavors to blend together for a more flavorful result.